Anthem Blue Cross filed a request to raise insurance rates by 20% to existing members for 2011. The 19.9 percent rate increase would affect about 48,000 Direct Pay BlueCare HMO, Century Preferred, Lumenos, and Tonik customers. The Jan 1, 2011 rate increase request is for “grandfathered” insurance plans that are not subject to many of the new requirements of the new Obama Care legislation. A public hearing to discuss these plans will take place later this month. Connecticut Insurance Commissioner Thomas Sullivan was recently criticized by the Obama administration for approving a previous rate hike for “non grandfathered” plans with little transparency and no formal hearing. 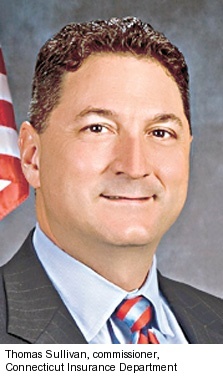 Sullivan, who had recently requested and accepted a 1 million dollar grant to help review insurance company rate actions announced Tuesday that he is resigning from his position effective Nov. 12. In an ironic twist, Hartford Business.com reported that on Nov. 15 Sullivan will start a new job at PricewaterhouseCoopers in Hartford, where he will be a principal in the firm’s national financial services regulatory practice, focusing on assisting clients with complying with the recently enacted federal financial reform legislation. Great isinght. Relieved I’m on the same side as you. I’m glad Sully is gone. He didn’t help our state with health insurance premiums. Not sure about his replacement. Time passes rates still go up. We need cheaper plans. This is why we need health care reform. The insurance companies have us by the balls and keep raising the rates. Hope the republicans see this. Let me get this str8. The guy asks for 1 million dollars to oversee health insurance companies, then approves a big rate hike for new plans without any oversite, then gets a new job helping other comply with health care reform. Huh???? Only in America!! !